For more than a century, scholars and artists have studied Afro-Cuban cultural traditions as a quintessential example of the African diaspora’s transnational networks, a “flash of the spirit” among survivors of the transatlantic slave trade (Thompson 1983). Afro-Cuban ritual music and dance have become increasingly prominent emblems of national identity in Cuba, but they have also been transplanted to the United States, Mexico, and Venezuela. At the beginning of the 21st century, these traditions thrive in disparate communities around the globe, leading some scholars to approach them as a world religion (Olupona and Rey 2008). Depending on which historical narrative you follow, Afro-Cuban culture might illustrate African retentions and survivals in the Americas, cultural adaptation and mixing, or transnational identities that resist the ruptures of slavery and modernity. I have contributed to the formal study of Afro-Cuban music in a variety of roles: consultant (performer, informant, interlocutor), technician (translator, recordist, producer), and scholar (researcher, writer, teacher). In each instance, my relative position—inside and/or outside the tradition—is often ambiguous and depends on specific contexts. Yet my role as a mediator of the tradition is based on what anthropologist Paul Stoller describes as “the power of the between”: “between two or more languages, between two or more cultural traditions, between two or more apprehensions of reality” (2009, 4). Figure 1. 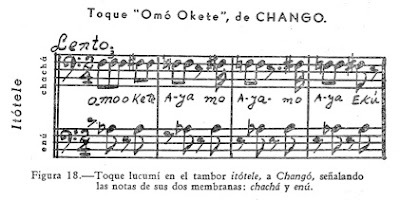 From La africanía de música cubana (Ortiz 1950, 369). Left to right: Fernando Ortiz, Gaspar Agüero, Trinidad Torregrosa, Raul Díaz, and Giraldo Rodríguez. Photographer unknown. A photo from Fernando Ortiz’s La africanía de la música cubana illustrates these roles vividly (Figure 1). Ortiz stands literally outside, overseeing the collection of musical data. Gaspar Agüero sits at the piano, synthesizing and transcribing the sounds. Master drummers Trinidad Torregrosa, Raul Díaz, and Giraldo Rodríguez demonstrate batá drumming, the iconic Lukumi genre which is often characterized as the pinnacle of Afro-Cuban music. The roles depicted in this scene each represent embodied traditions (plural) to which I have devoted my adult life and seem to flow and blend into each other. This is the sense in which I explore the perennial ethnograhic dilemma of being inside, outside, and between cultures. From this perspective, I would like to welcome the publication of Fernando Ortiz on Music by sharing a few reflections on the complex issues engaged in the book. My basic premise is that translation is not simply a linguistic act of paraphrasing from one language to another, but also an intercultural process by which we interpret and engage others. Therefore, the act of translation is a vital component of virtually all serious cultural work, and it is—necessarily—both literal and figurative.<1> Even if it is often taken for granted and approached in obscure or ad hoc ways, translation is a process of bridging cultures and realms of expertise. And even more broadly, translation offers uniquely valuable opportunities to consider how scholars use others’ words. To (ethno)musicologists, my second premise should be axiomatic: the broader cultural context of music—including what people say about it—is crucial to understanding and appreciating musical sound. Performers and scholars rely on specialized, vernacular idioms which are dynamic and multivalent: our interpretations of “the music itself” change continuously, and they always contain more than one dimension. As we engage our subject matter more closely by engaging with various idioms, we confront the fact that music, language, and culture all operate within varying degrees of fluency. Whether we are studying a requiem by Gabriel Fauré or an Afro-Cuban funerary chant, we strive to become familiar—that is, fluent—with the idiomatic qualities of music, language, and cultural context. How does the music fit into a tradition? How do we interpret its lyrics? What do experts say about it? What are the social actions, values, and meanings associated with it? At nearly every turn, we are translating. The ethics of translation present peculiar challenges, beginning with the troublesome business of ascribing singular meanings to utterances, reducing them to one dimension. How do we translate layers of nuance, poetic turns, idiomatic expressions, or ambiguities? Or multivalent language that clearly means more than one thing? And to what ends? In a few instances, I have witnessed first-hand ways the words of “informants” (including my own words) can be solicited under false pretenses or twisted to support covert agendas in brazenly unethical ways, especially in translation. But I have also—much more importantly—enjoyed the immense privilege of working with scholars of the highest ethical and intellectual caliber. These experiences have proven that the exchange of musical and cultural data depends on familiarity and trust—the elements that elevate interactions to the level of dialogue. In his virtuosic discussion of Fernando Ortiz’s impact on the Afro-Cuban batá drumming tradition, my late friend Michael Marcuzzi quoted verbatim from our conversations. Crucially, Marcuzzi shared his transcripts, ideas, and drafts as works in progress with me; as a result, my thoughts and their translation from Spanish to English might be occasionally awkward, but they are unquestionably my own (2005, 388-428). Likewise, while consulting with me over the course of several years during his studies of batá drumming, Kenneth Schweitzer shared and discussed numerous drafts of his dissertation and subsequent book with me (2003, 2013). In one particularly memorable instance, I enjoyed the privilege of translating a section of Schweitzer’s book from English to Spanish for its subject, the late master drummer Armando “Surdo” Pedroso (ibid, 43-49). More recently, spirited conversations with anthropologist J. Lorand Matory have focused on comparisons of the politics and philosophies of West African, Afro-Cuban, Marxist, and Freudian traditions (2018). In each instance, these dialogues delved into finer points of translation. This is Culture, Lost and Found in Translation: meanings shifting across languages and contexts, and meanings shifting perspectives. All of these dialogues depend on an awareness that positions within traditions are mutable. Indeed, a shared sense that we all shift between being insiders and outsiders is a precondition for dialogue, especially when literal translation is involved. While it is generally accepted that linguistic and cultural fluency are preconditions for knowledge of musical tradition, some scholars overstate their claims to fluency, inflating their own status among outsiders and—perhaps genuinely—confusing basic proficiency with an ability to carry on sophisticated conversations. Meanwhile, love and respect for individuals (and the traditions they embody) allow more earnest researchers to constantly refine their linguistic and cultural fluency as they gather musical and cultural data. Dialogue is simply the best way to improve our signal-to-noise ratio. Musical analysis can also be usefully considered as a type of translation that navigates the inside and outside of idioms. In conversations with Schweitzer for his batá research, we worked together to decipher aspects of the musical idiom of batá drumming: the parameters and terminology of orthodox repertoire and various kinds of improvisation. My research forces me to navigate linguistic and musical specialization simultaneously, placing me outside the tradition, even as I draw on knowledge gained by my experience as insider. For example, interviews with my teacher Angel Bolaños are infused with so much idiomatic material—Cuban slang and obscure historical and musical references—that they are functionally unintelligible to outsiders. Similarly, virtuoso drummer Maximino Duquesne’s analysis of his own approach to performance relies on an idiosyncratic terminology for musical technique and form (“lo abro y lo cierro, hablo” / “I open it and close it, then I talk”) that can only be discerned after immersion in his musical and cultural world. What emerges from this sort of immersion—ethnographic or otherwise—is the undeniable fact that masters of putatively “folk” or “indigenous” music are quite often brilliant polymaths grounded in their traditions’ musical theory, stylistic analysis, organology, and history. Regardless of formal education or literacy, they are—in a word—scholarly, and translation is the only way for outsiders to access their genius. Figure 2: El Monte by Lydia Cabrera (1992 ). My recent work translating Lydia Cabrera’s El monte into English has brought several of these issues into closer focus. Based on conversations during the 1930s, 40s, and 50s with elderly black Cuban priests who were one or two generations away from the transatlantic slave trade, El monte employs a virtuosic interdisciplinary approach. 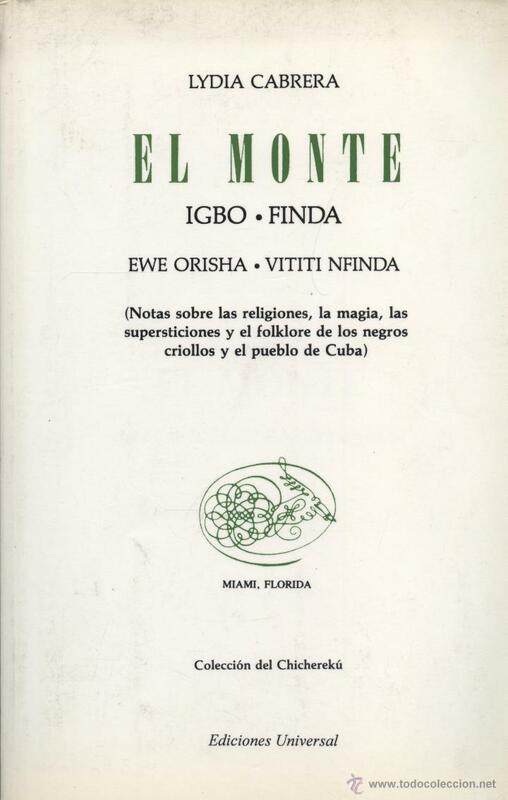 Due to its wealth of rich and esoteric detail, Cabrera’s text is often referred to as a “bible” of Afro-Cuban traditions. But it is not a bible in a literal, orthodox sense: fundamentally, it offers a radical alternative to notions of singular, fixed, authoritative text. Cabrera presents a variety of different voices; sometimes, they disagree. Like the traditions it documents, El monte constitutes a plurality, requiring readers to accommodate multiple perspectives at once. In this particular instance, Rodriguez-Mangual mistakes a discrete cultural and linguistic form (Lucumí) for a hybridized blend (“Afro-Cuban syncretism”). Misunderstandings of crucial details like these can lend support for a theoretical framework that is contrary to the evidence in Cabrera’s text, thereby inadvertently distorting the reader’s perspective on the text. 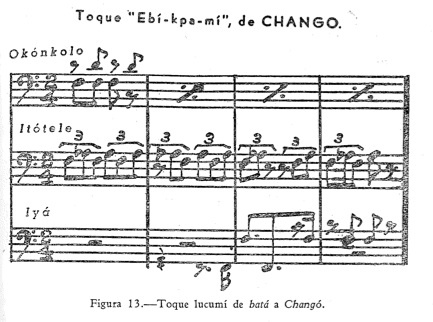 Figure 3: Two transcriptions of batá drumming from La africanía de música cubana (Ortiz 1950, 369). 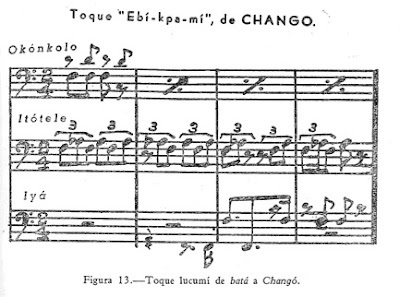 Returning to Ortiz’s seminal La africanía de la música cubana, it is also worth considering the idiomatic fluency necessary to confront the problems of musical transcription. 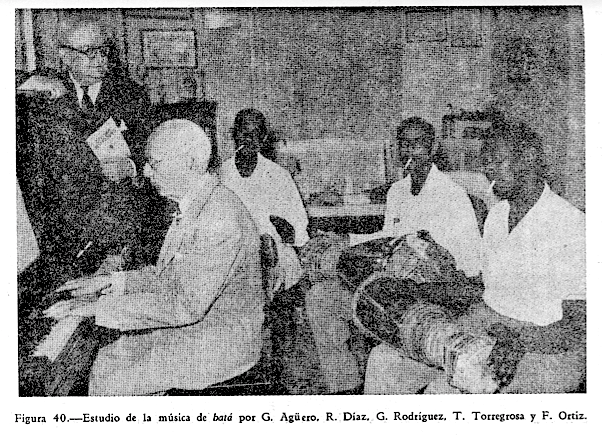 Several transcriptions of batá drumming demonstrate a conspicuous lack of musical and cultural fluency (Figure 2). Despite the best efforts of Ortiz and his collaborators, musical and cultural insiders who are familiar with these rhythms and able to “translate” the staff notation will recognize that the tonality and meter implied in these transcriptions (and a few conspicuous errors) are liable to obscure as much as they reveal. If the transcriptions had been rendered note-for-note on a piano, it seems unlikely the drummers would have confirmed them as accurate representations of their drumming. The underlying principle that continues to emerge from my experiences with translation in Afro-Cuban music is that our translations and ideas are refined through active, earnest dialogue with each other, including sharing our works in progress. By constantly navigating between the inside and outside of musical and cultural idioms, we are able to survey the edges of traditions, finding new ways to expand our perception of meaning across cultures—musical and otherwise. <1>Within Translation Studies, this approach is sometimes described as “cultural translation.” cf. Bassnett 2013. Bassnett, Susan. 2013 . Translation Studies (New Accents). 4th Edition. New York: Routledge. Cabrera, Lydia. 1992 . 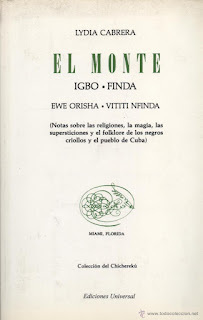 El monte: Igbo, Finda, Ewe Orisha, Vititi Nfinda. (Notas sobre las religiones, la magia, las supersticiones y el folklore de los negros y el pueblo de Cuba). Miami: Ediciones Universal. Marcuzzi, Michael D. 2005. A Historical Study of the Ascendant Role of Bàtá Drumming in Cuban Òrìshà Worship. Ph.D. dissertation, York University. Matory, J. Lorand. 2018. Marx, Freud, and the Gods Black People Make: European Social Theory and the Real-Life Fetish. Durham, NC: Duke University Press. Ortiz, Fernando. 1950. La Africanía de la Música Folklórica de Cuba. Havana: Ministerio de Educación. ———. 2018. Fernando Ortiz on Music. Selected Writings on Afro-Cuban Culture, edited and with an introduction by Robin D. Moore. Philadelphia, PA: Temple University Press. Rodriguez-Mangual, Edna M. 2004. Lydia Cabrera and the Construction of an Afro-Cuban Identity. Chapel Hill: University of North Carolina Press. Schweitzer, Kenneth. 2003. “Afro-Cuban Batá Drum Aesthetics: Developing Individual and Group Technique, Sound, and Identity.” DMA dissertation. University of Maryland, College Park. ———. 2013. The Artistry of Afro-Cuban Batá Drumming: Aesthetics, Transmission, Bonding, and Creativity. Jackson, MS: University Press of Mississippi. Stoller, Paul. 2009.The Power of the Between: An Anthropological Odyssey. Chicago: University of Chicago Press. Thompson, Robert Farris. 1983. Flash of the spirit: African and afro-american art and philosophy. 1st ed. New York: Random House. ———. 1999. “Communiqué from Afro-Atlantis.” African Arts 32 (4): 1-8. 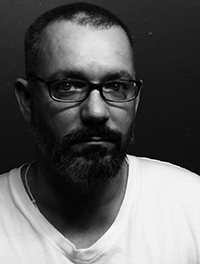 David Font-Navarrete has conducted primary and archival research in Cuba, Senegal, the Gambia, and the United States. The subjects of his publications include traditional Afro-Cuban and African music, the "tradi-modern" Congotronics series of recordings, the Sublime Frequencies label, and Bass. He is currently Assistant Professor in the Department of Music, Multimedia, Theatre, and Dance at Lehman College, CUNY.